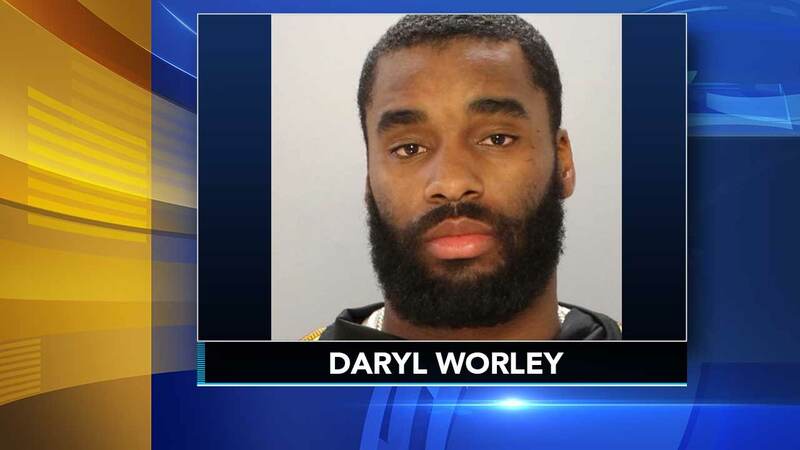 Philadelphia police have announced the charges against former Eagles cornerback Daryl Worley following his arrest on Sunday morning. Worley, who was released from the Eagles hours after the incident, has been charged with Violation of the Uniform Firearms Act, Driving Under the Influence, Disorderly Conduct-Fighting and related offenses. According to a source, the 23-year-old Penn Charter graduate was arrested at Broad Street and Pattison Avenue around 6 a.m. Sunday. The source tells Action News a call came in for a car blocking the roadway in South Philadelphia. Worley, who lives in Swedesboro, Gloucester County, was found passed out behind the wheel when officers arrived, the source says. He was arraigned Sunday night and a judge said he could be released on $25,000 bail. Following his arrest, the Eagles released Worley from the team. Earlier Sunday, the Eagles released a statement saying, "We are in the process of gathering more information about Daryl Worley's arrest this morning." The 23-year-old cornerback, acquired from the Carolina Panthers, grew up in North Philadelphia. He was a stand out at Penn Charter and went on to play at West Virginia University before being acquired last month in the trade that sent wide receiver Torrey Smith to the Panthers. His attorney, Fortunato Perri, spoke to Action News after speaking with his client on Sunday. "It's a very unfortunate situation, he hasn't had an opportunity," said Perri. "He can maintain his career." This is the second time in recent weeks a newly acquired Eagle has been arrested. Defensive end Michael Bennett was charged with pushing a 66-year-old woman during the Super Bowl in Texas two years ago. Both players appeared at a press conference just weeks ago when the Eagles announced they had joined the team.